In case you've been missing it, Randy Andrews has been posting animal classes for Dungeon Crawl Classics (we have a chicken, goat, and bear thus far). [Edit: Rat added November 5, 2016.] In a conversation on Google+, I made reference to a "Thousand Acre Deathcrawl," then stormed a brain and this fell out. I hope to expand on it shortly, but this should be enough to get you started. And sincerest apologies to A. A. Milne. If you prefer things in portable pdf, download it here. The Hundred Akers' Copse. Click to enlarge. Compare and contrast with this facsimile of A. 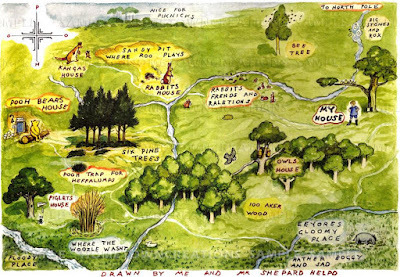 A. Milne's Hundred Acre Wood. Many years ago, all hundred members of the Akers clan — a coven of mad criminals, slackjawed backwoodsmen, weird occultists — left for a wooded land, never to return to the lands of Men. The place where they settled came to be known as the Hundred Akers' Copse, and wise men do not go there, for they pursued their fell research in that accursed place. In the intervening years since the Akers left the lands of Men, the place has turned into an eldritch hellhole of demons and mutants. And now, against all reason and sense, you're going inside. The Goal: Like a lot of hexcrawls, there could be any number of "goals" — rescue a companion, grab treasure, learn a new spell, or just go into the toolbox and mess with stuff. The straightforward goal is, "The musteloids have been stealing treasure from nearby settlements for years; there must be a king's ransom in their hideout (hex 08.19)." 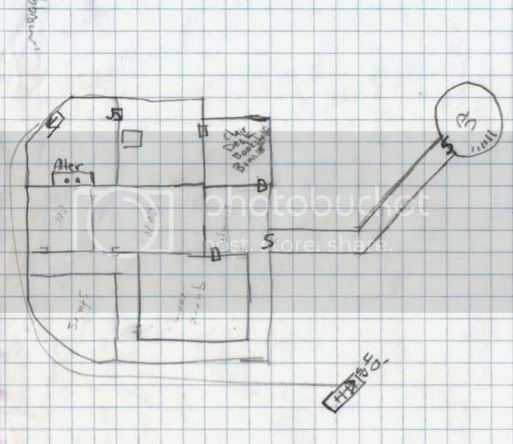 The Lairs: I haven't fleshed out the lairs yet, but you can compare the two maps and determine roughly what could go in each lair — a barbearian in hex 02.11, the bunnyman clan in hex 15.06, mutant bees in hex 25.02, the musteloids in hex 08.19, possibly an owlbear in hex 26.14. The last, lonely necromancer of the Akers clan lives in hex 34.22. The sole civilized inhabitant, the Lord of Thrushes, is an Elf who guards these woods, warning away travelers; he lives in hex 35.10. The Crawl: A hex is a couple of miles across (maybe two or three miles) and should take roughly an hour to cross. 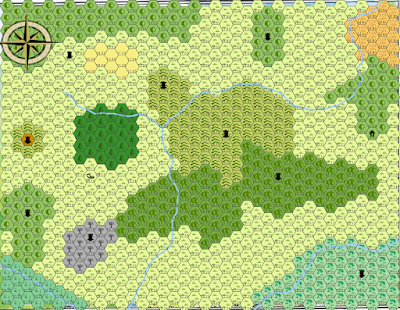 Hexes that are a little harder to traverse (like grassy hills or marshes) take an hour and a half. Difficult hexes (like dense forests) take two hours to cross. Each day of travel, or each time you change terrain, roll 1d6. On a "1," a random encounter appears from the random encounter table. Hellephant (type I demon): Init +2; Atk tusk +5 melee (2d6); AC 14; HD 4d12; MV 40’; Act 2d20; SP half-damage from non-magical weapons and fire, infravision, spells (+4 spell check): darkness, detect invisible, ESP; SV Fort +6, Ref +2, Will +4; AL C.
Hellephants are demons of greed somehow bound to the Prime Material Plane, specifically being trapped in the Hundred Akers’ Copse. They can smell precious metals and gemstones, and they roam the land searching for these things, which they then eat. (They care little for weapons or magic items, unless these things contain precious metals or gemstones as part of their construction.) If they encounter any characters carrying such things, they will demand them; even minimal resistance is met with immediate and merciless violence. Hellephants digest consumed valuables quickly, although there is a 10% chance that any given hellephant still contains precious items in its stomach, perhaps a handful of gold coins or a single gem. (Of course, the beast’s killer can only determine this by splitting the stomach.) Additionally, a hellephant’s bones have magic properties. If pulverized and spread on a stick of natural wood, the holder can cast locate object for the next 1d4 days with a +4 spell check. (If the holder is a wizard with the locate object spell, she gains a +4 bonus to her locate object spell checks for the duration.) If used as a weapon, the arm and leg bones deal damage as a club, but are enchanted as if by a 16-17 result on sword magic (see DCCRPG, page 367). Musteloid: Init +3; Atk bite +2 melee (1d8), dagger +2 (1d4); AC 13; HD 2d8; MV 30’; Act 1d20; SP backstab +6, hide in shadows +4, sneak silently +6; SV Fort +0, Ref +3, Will +3; AL C.
Musteloids are strange, wiry weasel-men who inhabit the Hundred Akers’ Copse. The mutant descendants of the original Akers clan, the musteloids have trained in secret among themselves as a den of thieves. They roam the Copse in packs, trying to steal anything of value and return it to their lair. There is a strong possibility that any given musteloid pack has recovered valuable items and is en route back to their hideout. Musteloids are usually encountered in groups of 2-10. Bunnymen are a degenerate tribe of cannibals also derived from the Akers clan. They are so-called because they dress themselves in the skins of the slain as well as the hides of rabbits, and they frequently fashion distinctive caps with rabbit ears (or strips of flesh in a facsimile of the same). Barely sapient anymore, they descend en masse upon anything that crosses their path, falling upon it with sticks and bones wielded as makeshift clubs. Treat bunnymen as subhumans (DCCRPG, page 429). Any group of ten or more is typically led by a berserker warchief (DCCRPG, page 433). There is a 25% chance that a given pack of bunnymen will be riding giant beetles (DCCRPG, page 397) into battle. Giant beetles are native to the Hundred Akers' Copse; in fact, a large nest of them is located in hex 21.10. They typically burrow underground, although they can also be found traversing the plains themselves. Specimens are often aggressive. Some have been trained by the bunnymen as mounts. Giant beetles are detailed on DCCRPG, page 397. All varieties can be found in the Hundred Akers' Copse. The strange energies of the wood have mutated a beehive in hex 25.02, and members of the hive constantly scour the landscape for both nectar and living meat. There is an equal chance of encountering an insect swarm (DCCRPG, page 419) or a group of killer bees (DCCRPG, page 419). The namruu are predatory cats that tend to hide in trees in the hopes of surprising passing prey. They are strange and grotesque-looking with earth tone hides, and lean and skeletal appearances. Namruu have the same statistics as giant lizards (DCCRPG, page 420).